We all like to do everything as professionally as we can, this sometimes can get very expensive and time consuming. Recently, as the team here at LogicLounge was looking for studio equipment we came across something on Amazon that will get every entry level video maker off the ground and looking professional. We found an all-in-one studio pack for all under $200. We came across a seller on Amazon called StudioFX who sells studio kits that will get anyone going on what they need. The particular kit that LogicLounge bought came with two bulb holders that power three lights a piece and three back drops with stand. These backdrops are excellent for anything you could possibly need them for coming in black, white, and green. 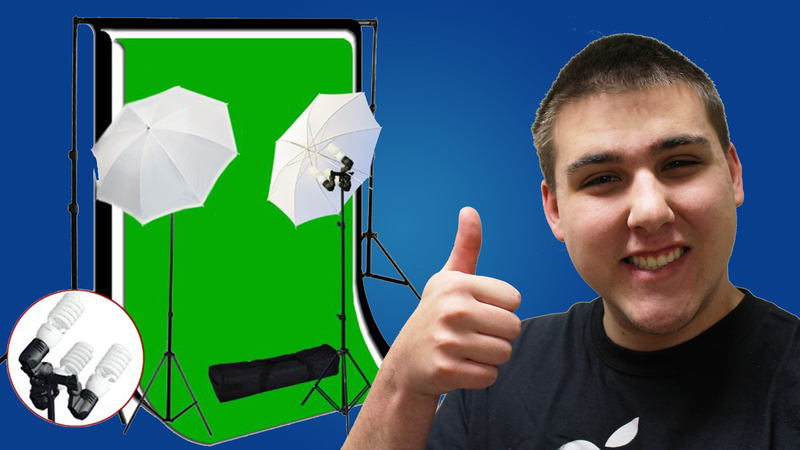 Great for any green screen work or a nice static background for videos. The whole system is powered by six 45W CFL bulbs running at 5500K, and they are powerful when all of them are running your whole backdrop can easily be lit with the subject and background properly lit. The overall build quality is alright, as with anything you get what you pay for. The stands aren’t of the highest quality and the locking screws care a little sensitive if you over tighten. But, they work if they’ll be in one place and not constantly being hit around. Its worked so far in all of our videos here, and that’s what counts. We love the backdrops but there’s only one down side to them. If you have a bright background behind the screen you’ll be able to see it. For example if you were doing it in front of a window then you would see the bright parts from the window when standing in front of it. We’re very pleased with our purchase of this studio set and we invite you to head over to Amazon and check out the one we bought and the other ones available to purchase, who knows you could find something that you want.